Now don't get the idea that I am one of those dark sinister people, I'm not! Mom and Dad called me that because they were always stepping on me. You see, after I found them I liked them so much, I just wanted to be near them all the time, and besides, they always had some really neat treats around. 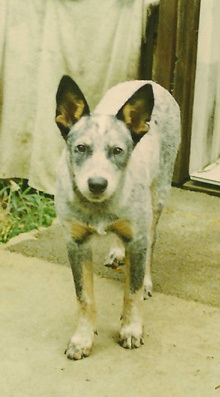 I am an Austrailian Cattle Dog, better known as a "Blue Heeler". Naw, I don't speak in one of those phony Aussie dialects like that little green lizard does on TV,( I bet he would make a great munchy, too). I got lost from my real mom when I was real young and me and my brother were hiding in an old abandoned house up near Bidias, Texas. Some people found us and took us home with them and put us in their barn with their dog. It was ok I guess, but some days later, on a Sunday, I believe, a man and a woman came to where I was staying. They introduced themselves as Larry and Kerry. Someone opened the door of the barn and when I saw them I said to myself, "Wow, these are your people! Go with them!" So I ran over to the man and rolled over on his feet and smiled at him my very best smile. The woman looked at me and smiled and then looked at the man and said "I guess this is the one". So they picked me up and we got into their van and I sat in Kerry's lap and away we went to their house. And so began a fourteen year love affair that was to change all our lives. Larry and Kerry lived in a house they had built themselves in the woods in southeast Texas. They ran their own business, they did art shows and fairs. They worked their own hours so I was able to spend all my time with them, and they took me everywhere with them. I soon realized the importance of behaving and being obediant, and the more responsible I became the more freedom I was allowed. I remember well one evening a few days after I came to live with them we went to a place and they got out of the van and told me to 'stay'. Yeah, whatever. They closed the door. What else could I do? But I soon learned what 'stay' meant and how it was an important word. Anyway, they went inside the building and stayed FOREVER it seemed. Finally they came out and Kerry had this flat box, and in it was the most delicious thing I had ever seen! They called it 'pizza'. I just devoured it and then licked the box to make sure none was wasted. It was to be one of my favorite treats. Mom and Dad's house, (I will call them that from now on) had an upstairs and that was the most fun thing. Mom was up and down those stairs a dozen times a day and I tried to be with her all the time. I had a great time. In the late afternoons we would go for walks up and down our street and Dad would practice with me the important words that all dogs need to know like 'stop' and 'heel' and 'walk' and 'stay'. He was very patient with me, and I learned quickly. Soon, he would take the leash off and I was proud to walk between my people on those afternoon strolls and sniff all the smells that came acroos the evening breezes, and sometimes we would go through the yard of a neighbor and go into a woods with paths much more exciting than our street and after the rains there would be ponds of water for me to run through and splash. That was so much fun. Growing up was very exciting. Occasionally a stray cat would come on our property and dad would let me chase it off, but he always made me stop at our property line. I would never hurt the cat, sometimes though, I would catch one sleeping in the sun and I would run really fast and just buzz it as I went by it or over it. Boy would that cat move! Except for one cat, his name was Bedevere. He was an old cat. I would try to play with him, but he would have nothing of it. Then, one day, I pushed the issue just a little too far I guess and that old cat raised up on his hind legs and gave me a karate chop right square on my Bentley Mark (for those of you that don't know, that is right in the middle of the forehad). "OUCH". And that was a learning experience. When I was about 4 1/2 months old, Mom and Dad spent a whole day putting all kinds of stuff in the van, the next day they woke me up real early and said "Come on, Shadow" and we were off for a trip. I had grown to like those trips, mostly to places like Magnolia Hardware as it was one of those places I was allowed to get out and go inside, and to the big building where they always came out with lots of food. But wow, this trip was different. We drove all day and late after it got dark we finially stopped. We went inside this building. The room was really small, and there was really nothing but a bed and another small room that I didn't understand, except it had water in it. We stayed all night but early next morning we left again and drove a long time that day. Mom and Dad said that this was Colorado, and they seemed to be really excited about it. It seemed nice to me and there was some really great smells. We stayed there for 2 days at a fair. It was really fun, there were lots of other dogs to meet, and some people down the street gave me some pieces of jerky. That became my very favorite treat. So it became a family tradition. Whenever we stopped at one the little food stores and Mom and Dad got a drink or treat, I would usually get a jerky treat. When we left Colorado, we went on to a place called Ohio, where Mom and Dad had more work to do. It was my first Renaissance Festival. People looked really strange but they seemed to have lots of fun, and the day after it was over I had lots of fun scoring all kinds of food treats on the ground. Like a steak on a stick and turkey leg scraps. Yum! In a few days we went back to our house in Texas and over the next year or so we didn't travel on many long trips, but we spent a lot of time doing art shows around Texas, like Austin Pecan Street Festival (wow, I didn't know there were that many humans anywhere) and the Texas Renaissance Festival. Actually I never was able to go to it. "Rules" Dad said. We lived right behind the fair and although I stayed home I could hear it and smell it. It must have been exciting cause mom and dad would come home all excited and tired and hollar "Where's my Shadow? ", and I would always be there at the door to greet them and they would hug me and pet me and tell me "good girl". They called me that so much I almost came to believe it was my name. When I was about 3 and a half years old Mom and Dad bought this big old trailer and Dad built us a house in it. The first big trip we went was to a place called Quartzite, Arizona. We stayed there for several weeks and it was a real nice place with lots of new kinds of smells, but the ground hurt my feet and I kept getting stickery things in my feet. I decided I liked Texas and Colorado much better. We had a friend called Dave Love that came to see us a lot. In fact, he had his house in our back yard for a while. But one time he came to see us in the big trailer and Mom had put my chicken up on the bed on a towel, and Dave kinda reached up and got close to my chicken and boy I got after him for that! Of course, he didn't do it on purpose, and he apologized for it, and I was really embarressed for growling at him. 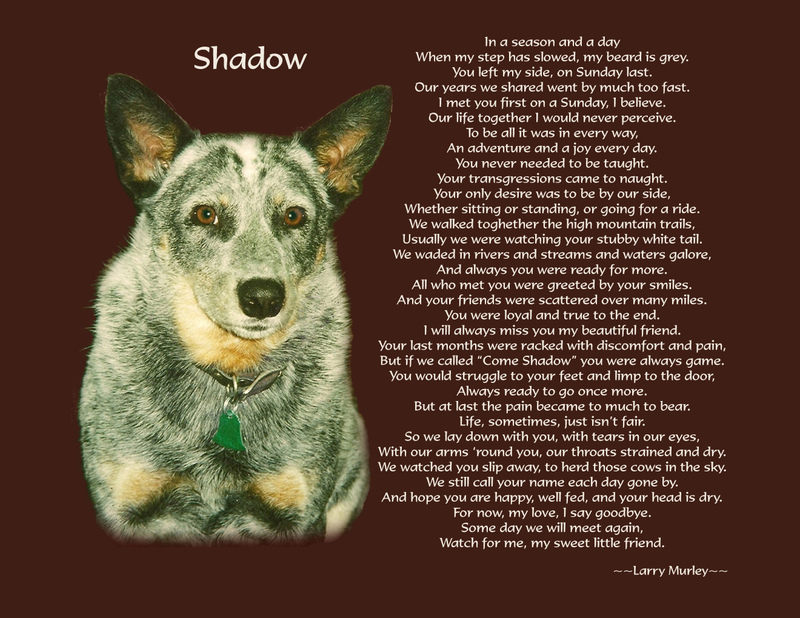 For the rest of my life, everytime I was finicky about eating my dinner, Mom or Dad would say, "Better hurry Shadow, Dave is coming to get your chicken", even when it wasn't chicken. When I was about six months old, Mom and Dad took me to Dr. Taylors' office. He made me go to sleep and when I woke up I was really sore and felt all yucky. I never really felt the same after that. Sometimes I would be sleeping comfortably and I would wake up all hot and panting. Later on, Mom would call them "hot flashes. I had to spend the night with Dr. Taylor that night, but in my whole life I never had to spend another night way from both mom and dad. Always, at least one of them would be there. When I was about a year old, Mom and Dad traded their van on a big green truck, they called it a Dodge Diesel, Mom told everyone they got it for me so I could go everywhere with them and they would leave the motor running and the A/C on for me. A/C is really nice. We went all kind of places and had all kind of adventures, I will try to remember some of them throughout the story and relate them. I had so much fun (Mom called me "Laughing Dog"). I would like to tell them all, but I don't want to bore you. I want to tell you about Chris. Chris was Larry's youngest pup....oops, son. Chris lived with us about half the time when I was young. Later on, he left home and I didn't see him very much, but the interesting thing was that Chris would show up unexpectedly in places. Like the time Mom and Dad were going to have dinner in Castle Rock, Colorado. We pulled up in the parking lot and low and behold, Chris stuck his head through the window! It surprised me so badly that I barked at him! I always liked Chris. When he was young he had a room that was outside of the house we lived in. Sometimes if Mom and Dad had to go somewhere they couldn't take me I would go to Chris's room and stay. It was okay and everything, but I was always happy to hear the sound of the diesel engine when they returned and I would run downstairs and wait at the door until they came to get me. It was always great to be with them and there was usually a treat for me as well. 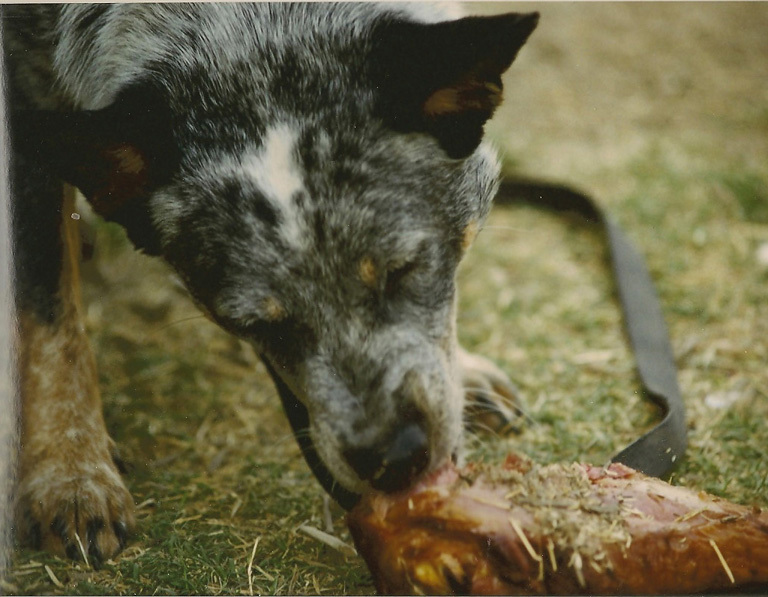 For you that don't know about Blue Heelers, it is our very nature to be very attached to our people. Our bonds are strong, our desire to please is great and our loyalty is boundless. Our desire is to be with that person - or in my case people - all the time. 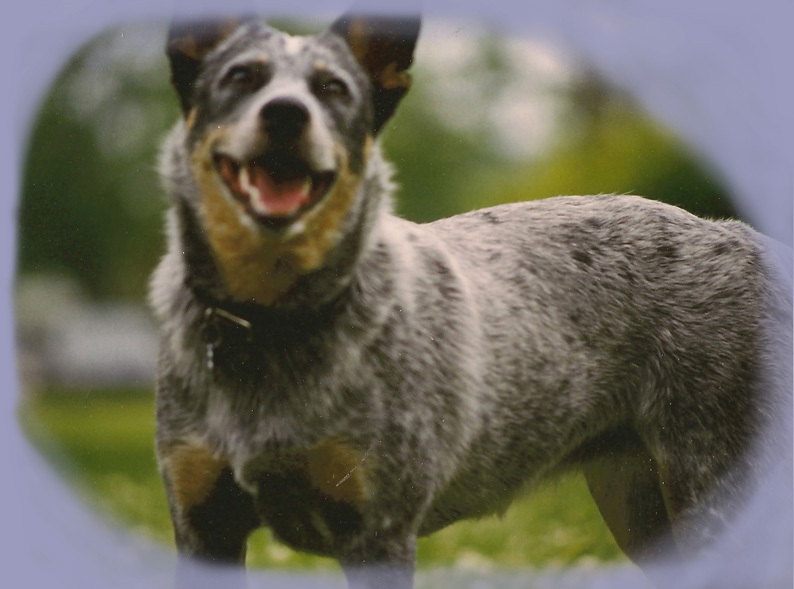 So, if you are looking for one of the canine family, before you take a cattle dog, make sure you have time to be with him or her. It is very important. 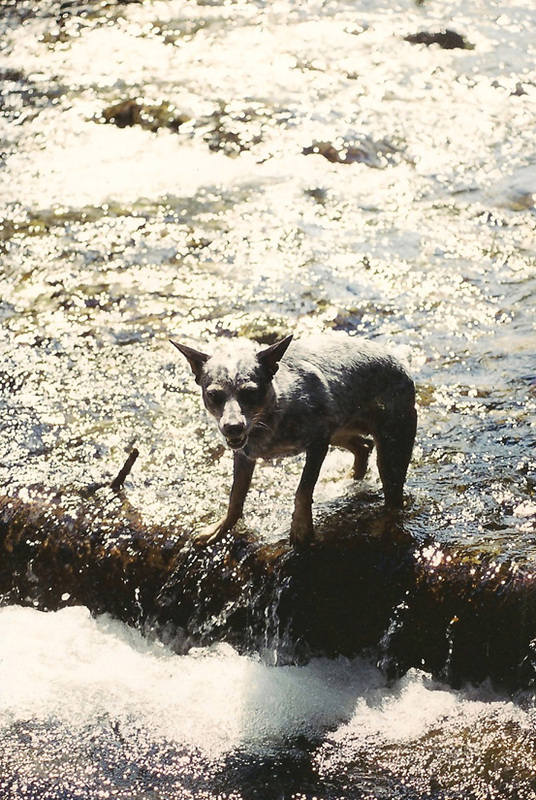 I have heard about people that chain their heeler up, or leave it fenced in a small area for days and days and wonder why it developes a bad attitude or becomes destructive. We are working dogs. We need a job and responsibility we need lots of exersize, but most of all we need to feel needed. I was about 3 when Mom and Dad started expanding their business and doing more traveling, and we started doing more shows in Colorado. And we would also go to places like Florida and Tennessee and Virginia. There lots of new smells and things to see everywhere we went and I met lots of other Cattle Dogs and whereever we went people would stop and tell Mom and Dad stories about their cattle dog. Once in Tombstone, a man all dressed in cowboy clothes and a duster wearing a sixgun on his hip stopped to talk. "Let me tell you about my heeler, Buck" he said. He went on to tell how he had a ranch out side of town. He was out riding fence one day when he found a break and a bunch of cows had gotton out. So he told Buck to go get them. 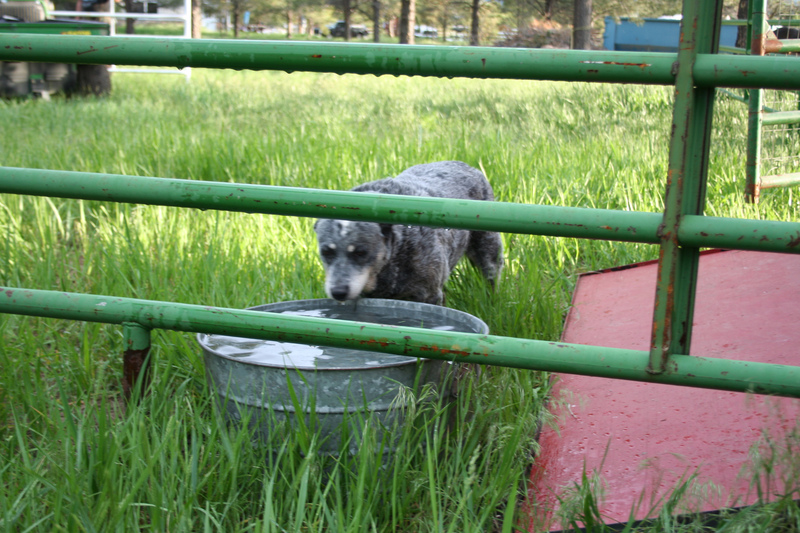 Buck, being a good cow dog, soon had the errant cows rounded up and back on the right side of the fence. The cowboy said "Hold 'em, Buck" and Buck did. So the cowboy got down off his horse and fixed the fence, remounted his horse and picked up the lead on his packhorse with all the fence posts and such, turned and said "Good job Buck!". Buck was so excited and happy with pleasing his person that he heeled the pack horse which bolted forward sticking the steel fence posts into the rump of the cowboys horse which immediately put on a rodeo show doing everything except unloading the cowboy. The cowboys last words were, "I should have shot that damn Buck"!!! I think it was on that same trip that I first discovered snow. Wow! What cool stuff and it is really cold, but you can root into it and burrow and plow through it and it is so much fun. In later years I got to live in a place where there was lots of it, but more later on that. For a few years we went to a place called Quartszite, in Arizona, and we would live in the desert in our van and later on a trailer. But there was always lots to see and do, I never was bored very long. I learned that walking in the desert that you had to be careful, because ther are sticky things in the desert that hurt feet, and other places too. Some of the bushes will actually reach out and grab you and stick to you. I always liked the mountains better. We went to a lot of places I liked. We went to a place in Maryland one time called Murley's Glade (Dad's name is Murley). I heard him say that George Washington had camped there one time and had written about Murley's Glade (whoever George Washington was). I was a very lucky dog. From the time I was a very young pup, one of my favorite places to go was a place called Magnolia Hardware in Texas. The people there were always nice to me and would pet me and scratch me. Whenever I would see our truck pulling into this place I was always ready to jump out and see my friends Mike and Keith and the dozens of others over the years that was there for a while. People that have businesses should realize that dogs love to be with their people and going into a business is a really good place for a good dog to show their manners and make their people proud. Mom and Dad would always laugh that the people at Magnolia Hardware because when they entered with me there was always a chorus of "Hi Shadow" from every one but no one ever said "Hi Larry or Kerry"! So Mom and Dad would always look for dog friendly businesses to trade with, and if someone showed they just didn't like dogs, then they just didn't go there, I always appreciated their loyalty. 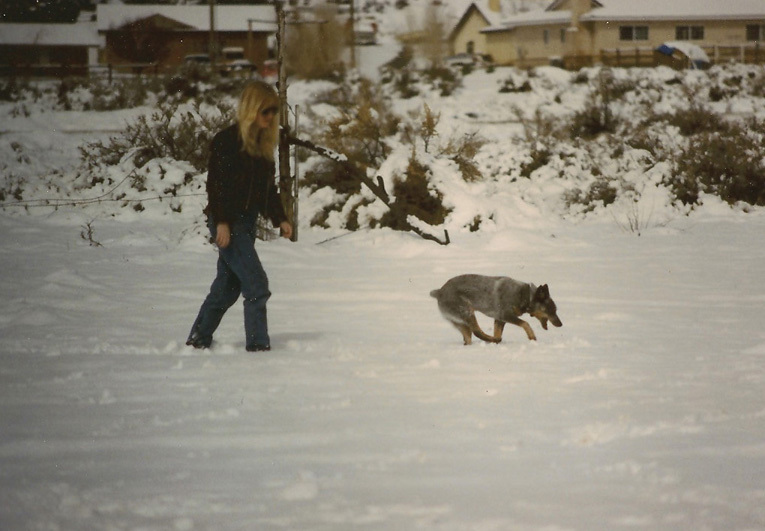 Dad always seemed to think that children and dogs would be as good as you allowed them to be so he always worked on the philosophy that with responsibility comes freedom. He always gave me lots of freedom and I always was responsible and if I made a mistake he was very gentle in correction of that mistake. I was always very loyal to Mom and Dad. We lived in a place in Colorado for a year on the Arkansas River in a town called Salida. Mom and Dad had a store there and every day I would get to go to the river two or three times to do my doggie business and there was usually lots of other dogs there and they were very social. I don't think I ever saw a dogfight all time I was there. We would go and play in the water and we would run up and down the banks and chase each other and it was so much fun! There should be more places like this for dogs. So many people keep their dogs imprisoned in their backyard or on a chain staked out in their backyard and they never get the chance to be loyal and to be everything that they can become. People, think about how you would feel if someone put a collar around your neck and put you on a stake in the backyard where there is nothing but dirt and your food was brought in a pan that got bugs in it and that you were made to sleep there at night. How would you like it? You know dogs have feelings too. Okay, I'll get off my soapbox and quit preaching but I just thought you should know. 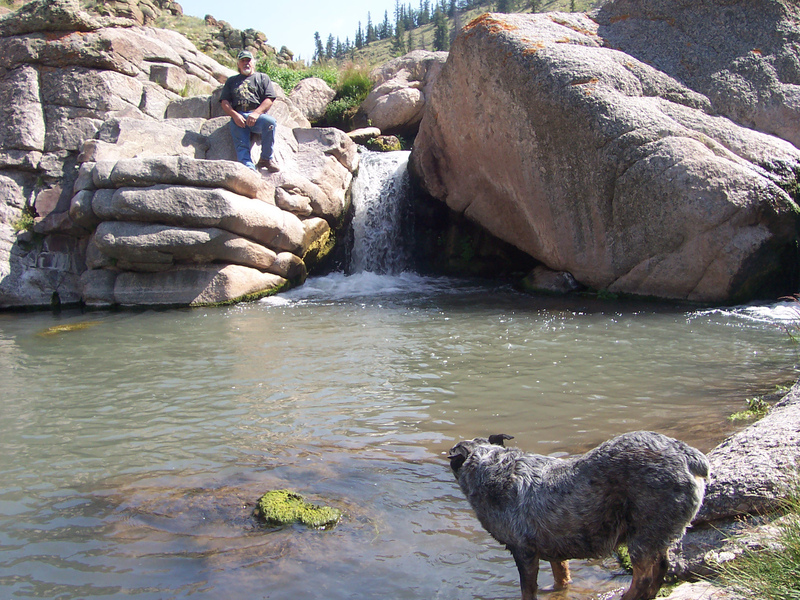 During the summers in Colorado we would hike the mountain trails in the high country and there was always lots of chipmunks running around on the rocks and there were streams to wade in. But Mom andDdad always kept me respectfully near them, not that I really wanted to be anywhere else anyway. But occasionally I would drop back to check out a smell on the grass or something and then I would see they got ahead of me and I would come running and zoom by their legs! They always thought that was lots of fun. "Incoming!" they would shout! One time, we pulled in the campground at Blue Lake, and I was the first one to jump out of the truck, there was a little chipmunk there. Before I knew it, I had jumped on it and bit it. It squealed and quit moving. Mom and Dad were not real happy with me, I never did know exactly why. We went to places like Gray Rock and Blue Lake and Roaring Creek. 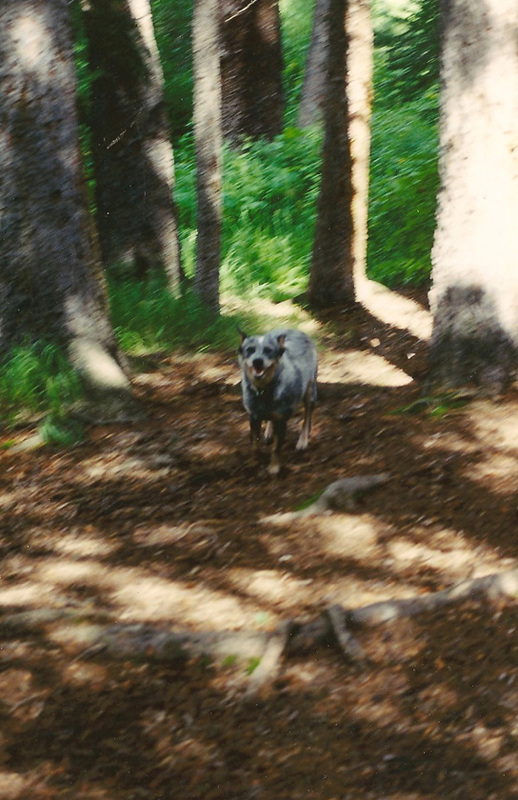 These trails had people on them sometimes, and sometimes I would meet other dogs. That was always fun to get to meet another dog. Later on when Mom and Dad bought a piece of property up in the mountains. They called it 'Whitehorn'. We would go up and spend the entire summer there and there were cows running loose everywhere! Cows would come up around the trailer where we lived and I thought it was my job to keep those cows away from Mom and Dad. So I would watch the cows, and when they came within a certain distance I would go down and bark at them and make them go away. It was a good job. I'd never got to be a real cow herding dog but that was lots of fun keeping the cows away. One time though, there was a bull and he was a very ornary bull. So I went down to make him move but he would not move. He just lowered his head and he would charge at me. I would bark at him and I tried for a long time but that bull just wouldn't move. I would bark and would circle around him and he would just turn around and keep his head lowered and I could never get him to go. So finally I got tired and I went walking back up the hillside to the trailer. Dad was standing up there and I got almost back to Dad and it looked like he was disappointed because I didn't make that bull move. So I got real angry and turned around and I ran straight back at that bull barking as loudly and visciously as I could! And that bull turned and ran away! I was so proud as I went back to see dad! He said "good job Shadow! Good girl!". You know that good girl was my favorite thing he said. He said it a bunch in my life. One time, Mom and I climbed up to the Aspen Grove above our place. They called it our back yard, it was very pretty up there with a view of Black Mountain. On the way down a rabbit jumped up and ran! 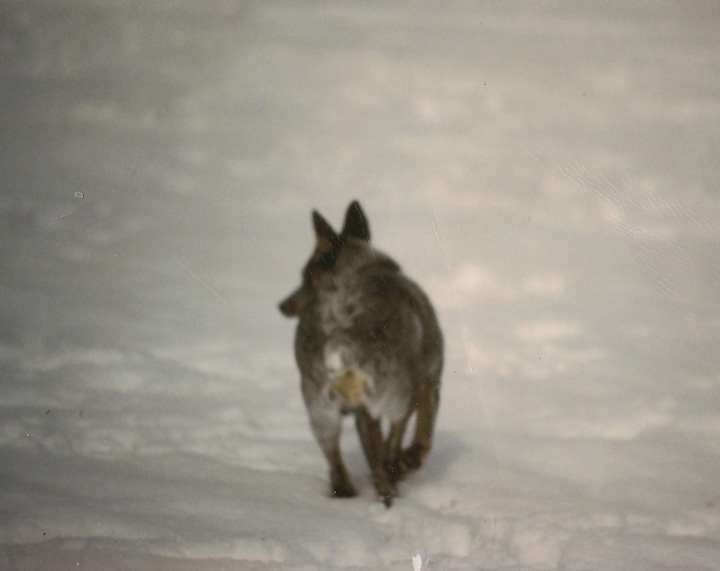 I chased it as fast as I could and finally I reached out and grabbed it with my mouth, and bit it. I carried it down the mountainside to the house and showed Dad, he smiled and asked me what I was going to do with it. It seemed to taste really good, but I was kinda embarrassed, so I took it over behind a chapperal bush, and I ate the whole rabbit! I never was able to catch another one the rest of my life, darn it. 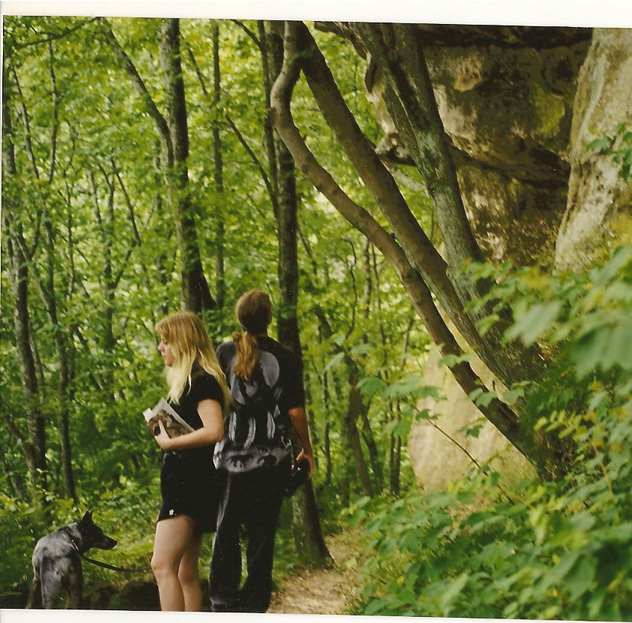 I sure loved that place in the mountains but as I got older it was very hard to walk the trails and to breathe. 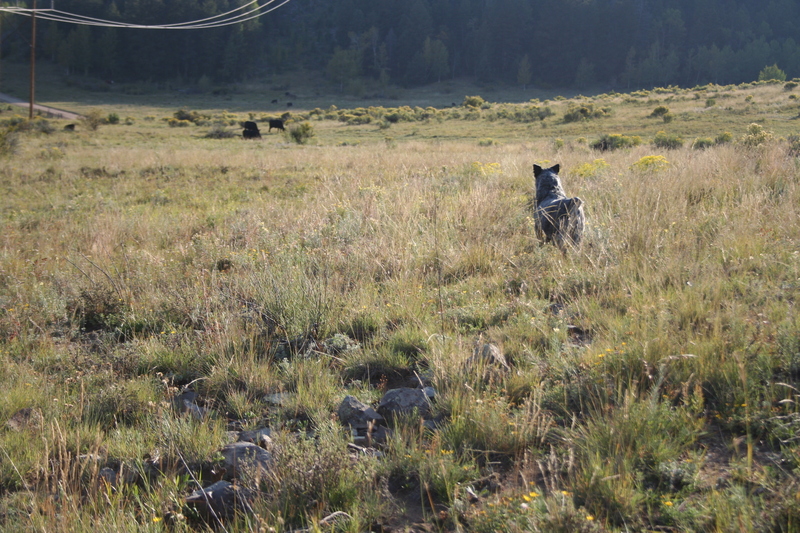 There was a real cowdog up in the mountains. 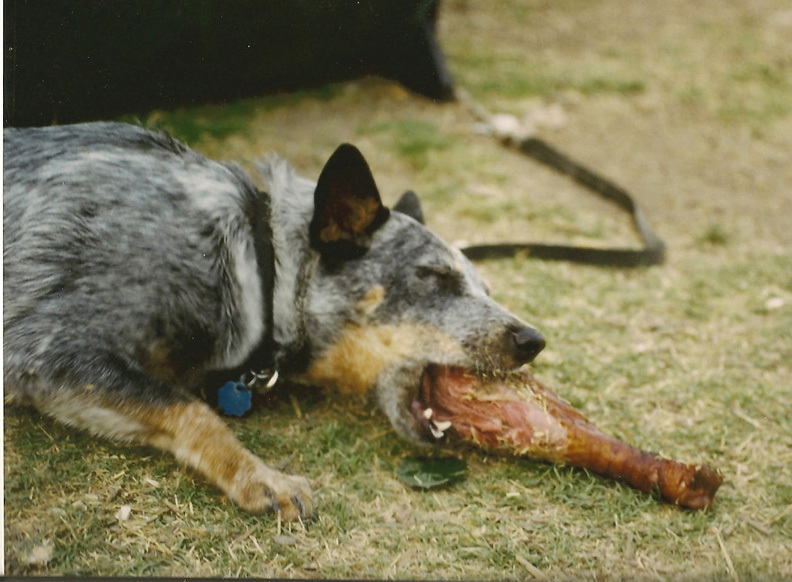 Her name was Jinx, she was part cattle dog and part border collie. She could take a hundred head of cows all by herself and make them go through a gate and then stand there and those cows would never move. I sure admired her, but she wasn't very friendly to me. I want you to know, I have been a lucky puppy. I have been able to interact with humans in a much more relaxed atmosphere than most dogs ever are able to have. I have gone to a few dog friendly realitives, I have been to concerts, (they hurt my ears sometimes), I have been to socials, and lots of places where most dogs don't get to see. Humans need to take their dogs with them places and teach them polite behavior and manners. The more you do that, the more fun it will be for you and your dog and your dog will make you proud. If you dog loves you like I did Mom and Dad, then he or she will give it's all to do the things that make you happy. Don't ever forget that. I'm sorry to say it but humans don't always think like that. Humans will go off and leave their dog on a chain or in a small pen for days. The dog would never think of leaving their human for that long. 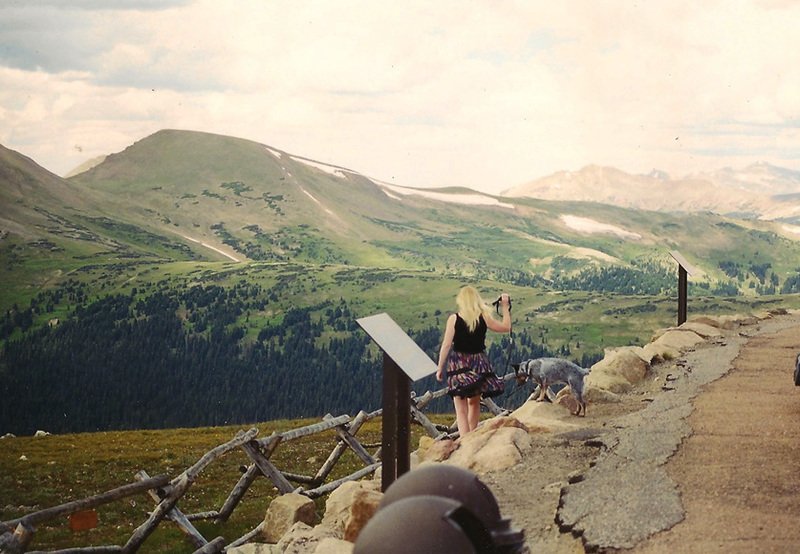 Some humans don't realize the dog can enjoy pretty scenery. I always enjoyed going to Colorado and riding in the truck and the mountains on the narrow curvy roads I would stand on the console and 'surf' as dad and mom would call it. I would surf through the narrow bumpy roads and when we got to the highway I would go lay down the back and snooze until we reached our destination. I like the evenings in the mountains. We would all sit around the fire just before dark and listen to the sounds of the forest. I could hear much more than Mom or Dad could and I could smell things too, that they couldn't smell. There was always much more going on than Mom or Dad ever knew about out there in the forest. I didn't always catch everything though. One evening we were sitting around the fire and I was sitting in Mom's lap when suddenly a bunch of coyotes started yelping just below the lower rise where we were setting. I had no idea they were there and I went right straight up out of Mom's lap ready to defend them at my own risk. But Mom and Dad wouldn't let me do that. Dad went and got his gun and shot it once, and the coyotes all left. When I reached the age of 11 or 12, my life started slowing down. I couldn't walk as far or as fast as I used to. The afternoon hikes with Mom and Dad were getting shorter and shorter. I still enjoyed them but I just couldn't keep up even when they would wait for me, and I would get so tired. Mom and Dad would always take me with them though, and they were always patient and if I needed a boost to get up in the truck they were always there to help. Dad would build boxes or platforms in the truck for me to lie on so I could be comfortable and still see everything. He always tried to make me comfortable and they would always try to make a space for me regardless of where we were. In the spring before I was 14, I developed a little growth on the my right front pad of my foot, and it began to hurt when I walked. Mom and Dad looked at it several times but they thought I'd just stepped on something. By then arthritis had made it difficult for me to get up and down and to walk. That spring was busy. We did shows in Oklahoma and in Texas. Our truck broke down so dad had to get another truck and finally it was time to go to Colorado for the summer. But by the time we got to Colorado my foot was really causing problems and hurt alot so Mom and Dad took me to the doctor. The doctor wasn't sure what was wrong, but she gave Mom some pills to give me to ease the pain. 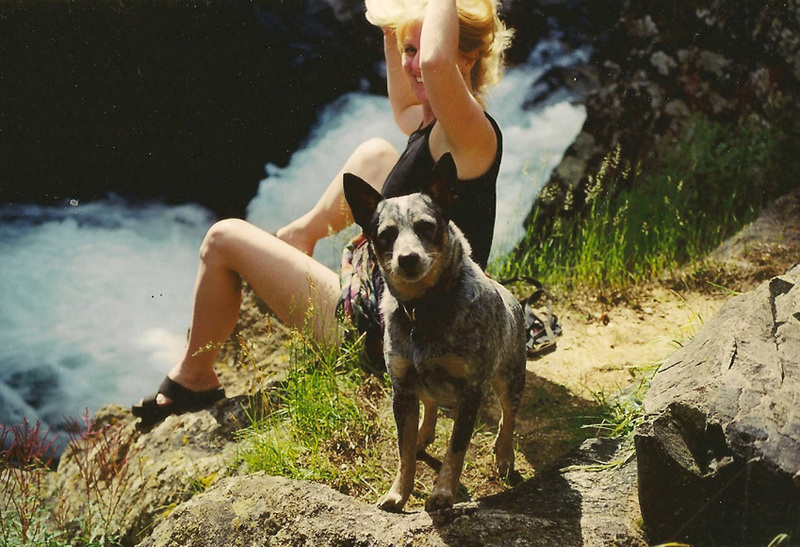 I also had a growth on my left back leg, and it was getting more and more difficult for me to jump in the truck or to jump up in the trailer or places I needed to go all time. Still, Mom and Dad were always there to help. They would let me go and help feed the horses and it would take me forever to walk around and do my job, but I still wanted to try. 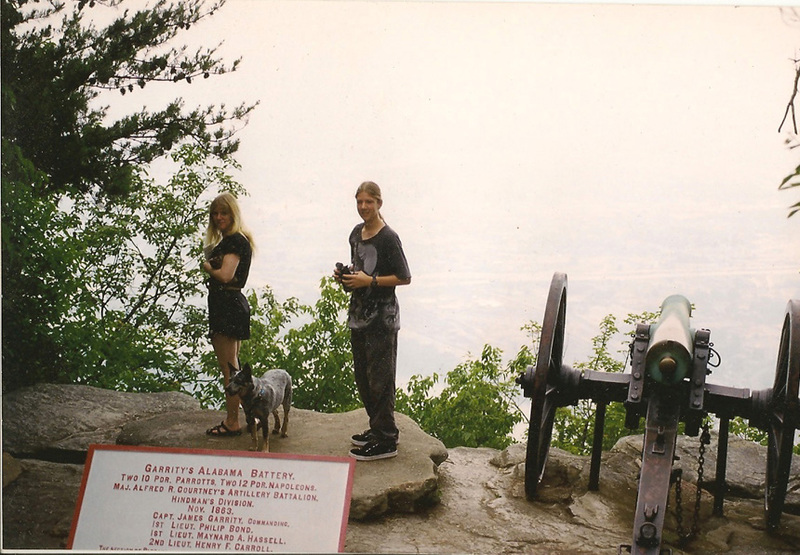 We only went to the mountain twice that year and I didn't get to do much cause it was so hard to walk. I never got to go to Badger Falls at all that summer, because it was to far for me to walk. I didn't know it, but I would never get to go back there, and it was one of my favorite places. 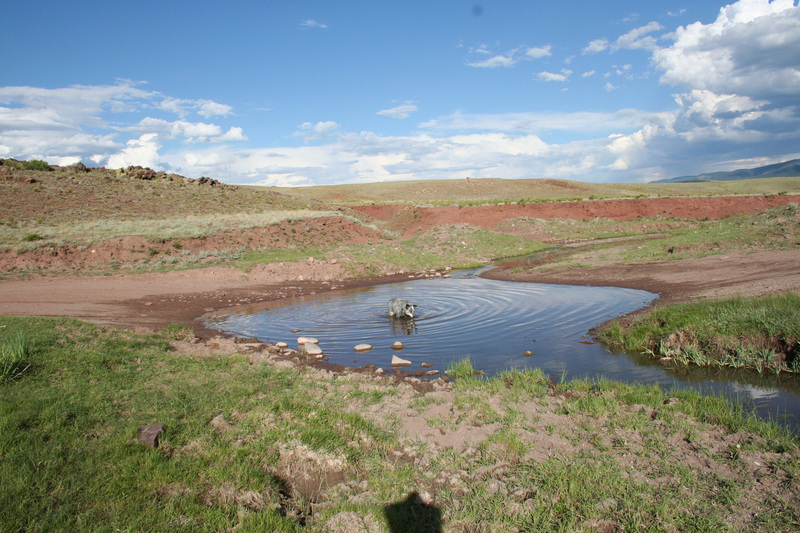 Cool streams of running water with little ponds to wade in and big flat rocks to lay in the sun and dry on, and oh yes, the bighorn sheep that would stand on the rocks above us and look down. One year, when I was about 10, we came across a big herd of Bighorn Sheep right in front of us! I got real close to them before I barked, and they all ran up the hill. Mom wasn't too happy with me doing that. Chris and Sara came with us to the mountain one time that summer with dad's new granddaughter Lea, but I felt so bad I really didn't enjoy the trip very much. Soon it was the end of July. The Colorado Renaissance Festival was over. Dad and Mom had incurred some expenses with our truck that made them decide that we would not stay in Colorado for August and September as we always did. So we loaded up our trailer and went back to Texas. It was 1 August and it was very hot. The trip seemed longer than usual. On the first day it was so hot the truck would overheat if we tried to drive fast. So dad decided to drive all night long in order to get to Texas before daybreak the next day because of the horses in the trailer. I had to lay in my bed between the seats between mom and dad. I was so uncomfortable I couldn't sleep the whole night. 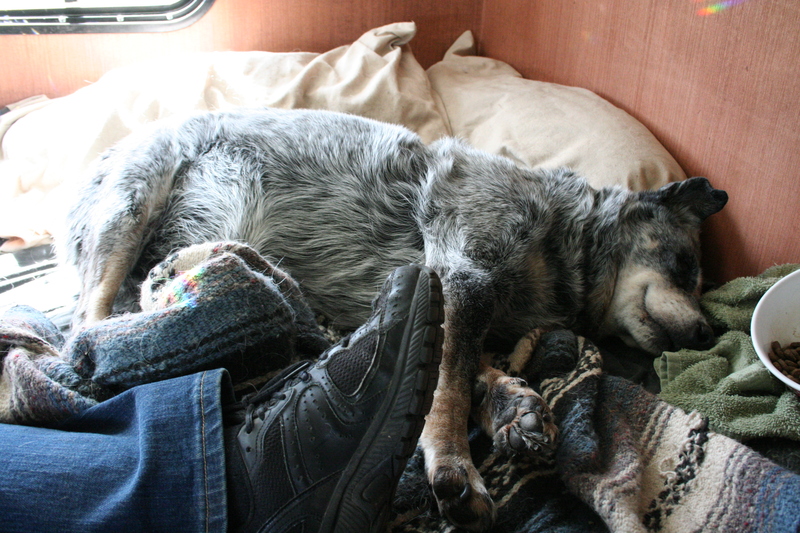 We would stop every so often to fuel the truck and to rest a bit. I was so tired and my foot hurt all the time, but I didn't complain because I knew it was so hard for Mom and Dad as well. I remember drinking a lot of water that night but I couldn't eat much. About 8:30 in the morning, the next morning we arrived home in Texas it was very hot there too. Mom took me immediately upstairs to the bedroom and turned on the AC and I curled up in my bed and slept most the day it was so good to be home. During the next few weeks I spent most of my time in our bed under the AC, it was just too hot to be outside. My foot continued to get worse until I could hardly walk on it at all and the lump on my rear leg just kept getting bigger. Mom and Dad took me to two more doctors. The first one said it was just a sore place on my foot nothing special. How could he say that? He didn't have to walk on it. Actually he hardly even looked at it. The second Dr. examined it more thoroughly and told Mom and Dad that it was cancer and they couldn't do much for it. She said they could amputate it, but because I was so old - I was 14 now - they didn't think I could stand it and the other lump was getting bigger all time. She also said that I had Cushing's disease, whatever that was. Mom and Dad looked really sad, and didn't talk much on the way home. She did give me some medicine that made me feel some better and I didn't hurt quite so much unless I stepped too hard on my foot. On Labor Day Mom and Dad had been in the studio working on a harness for Tobi the horse. It was still warm outdoors. They decided to go in the bedroom where the A/C was and take a brea. We had been up there for about an hour when someone called on the telephone and said there was smoke. We went outside and to the east of us a huge pillar of smoke towered over the top of us. We quickly loaded some essential items in the trailer and put the horses in also and we went out the back road through the fairgrounds and went up behind the office where the equipment is parked. We sat there for several hours while water trucks were coming in filling up and fire trucks were coming in and out. Finally, when it seemed like the danger was past, we went back home and went to bed. Early the next morning the firemen and the police came and told us we had to leave again. We loaded more stuff and the horses again and went out to the far side of the faire for a few hours. Then they told us that we probably wouldn't be able to stay there because the danger was too close, so we drove Planterville, to a restaurant called the Relay Station. They had an arena behind the restaurant where Dad and Mom put could put the horses. We wound up staying there for five days till the big fire was finally put out. Mom and Dad would tell me to stay in the trailer when they fed the horses in the evening, but I just had to get out and help but every time that I did I would jump down on my sore foot and it would hurt so bad that I would cry out. Then Mom and Dad would come along and pick me up and put me back inside. During the day, we could hang out in the cowboy church behind the Relay Station, I really liked that the floors were really cool to lie on, any comfort was welcome because I felt so very bad. By this time, most of the time, whenever I had to go outside even at night someone would have to carry me down the stairs and up again because it hurt so much. Sometimes I would try it when no one was looking, and a couple of times I would fall down the stairs, and that would really hurt. After the fire was over, Mom and Dad started on getting ready for the Renaissance Festival to start. Mom and Dad were very busy, but not too busy to help me up and down the stairs and to take me wherever they could with them. But by then, sometimes it was better if I stayed home in bed rather than go in the truck with them. And that was always my favorite thing to do above all others, to ride with them in the truck. Because all my life I had been with them everywhere all the time - at home and in the truck and I still miss that. There was always something new or somebody new to say hello to, like my friends at Magnolia hardware. It was my favorite place to go, always. But even that, became too difficult to be helped into and out of the truck, and to walk the short distance into the store on my sore foot. The week before the Renaissance fair started, Mom had to start giving me bigger doses of my medicine because the pain just kept getting worse. I could hardly walk, and the growth on my back leg would break open and drain and Mom would have to put covers on the bed so that I wouldn't soil it. It was so embarrassing to me. All my life I always tried to stay clean. This Saturday that the Renaissance Festival opened I was feeling very bad. My foot hurt all the time I could hardly move around on the bed with it. Dad stayed home with me most of the day. He tried to get me to take my medicine, but I just couldn't seem to get it down. And that evening, after the fair was over Mom and Dad came home. I started to hurt so bad that I was uncontrolable. I would thrash around, I couldn't eat, I was so ill. Finally Mom got a few pain pills in me, and I got down on the floor beside the bed where it was kind of cool and I guess I kind of passed out. I heard Dad say, is she gone? I didn't know what he meant, because I never wanted to go anywhere without them. I lay there most of the night and I can remember them laying crossways the bed almost all night, with their hands on me, just touching me softly. That meant everything to me. I awoke Sunday morning to the rain falling. My pain was not getting any better. I was so sick I could do nothing but lay on the bed. I can hear Mom and Dad talking about what to do. Sometimes they would sit beside me and cry. Finally, in the afternoon, Dad picked me up in his arms and carried me downstairs and put me in my truck. He and Mom got in and we started to drive the familiar road toward Houston. I always loved to go for a ride with them. Finally, after a while, we came to an animal doctors place. I remember Dad arguing with the people, saying no, that he had to go with me. Finally they agreed. He picked me up in his arms and carried me into the building. It was a strange place I had never been to, and I looked around behind me to make sure Mom was coming in as well. It seemed like a scary place, the energy was not right. But I was glad to see Mom coming in with us. we went into a nice room with carpet and couches and Dad put me down on the floor. Soon, a doctor came in and put a needle in my leg. It's okay, it didn't hurt, but Mom and Dad were crying anyway. The doctor asked us if we were ready, so Mom and Dad lay down on the floor, one on each side of me and put their arms around me. As I lay there, with my two best friends on each side of me, the very same way I had lived my whole life, I closed my eyes and the pain I had felt for so long slipped away from me, and I felt young again. I felt like I could run right straight up a mountain. But I could hear Mom and Dad sobbing loudly. I didn't understand. Why they were so sad? Mom, Dad, I'm okay now!!!!!! !